Who doesn’t love a good ugly Christmas sweater? There’s nothing better than jumping into holiday season with a Christmas sweater that says “Merry Christmas ya filthy animal” or has light up LED lights. Ugly Christmas Sweater has teamed up with Commission Junction and ShareASale to create an amazing affiliate program managed by Versa Marketing! At Ugly Christmas Sweater you are guaranteed to find the perfect sweater that fits your personality. Their affiliate program offers you the chance to earn commission and link your visitors to these awesome sweaters that will make the holiday season. 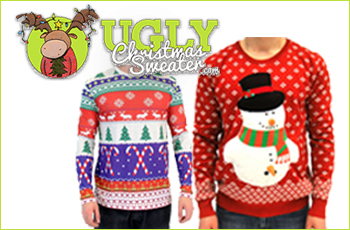 Ugly Christmas Sweater has an incredible inventory that includes leggings, pajamas, hats, jackets and even sweaters that don’t have to do with Christmas. Ugly Christmas sweaters inventory includes product categories such as: 3D sweaters, beanies, pet ugly sweaters, jackets, leggings, light up sweaters, NFL sweaters, pajama/onesies, and even star wars sweaters. They offer 18 officially-licensed NFL team logo ugly holiday sweaters, all made with quality material and available in several sizes. All of Ugly Christmas Sweaters products are made with quality material and are made unisex, fitting men and woman both perfectly! They have been featured in USA Today, The New York Times, Trend Hunter Magazine, Mashable, The Huffington Post, and Major League Baseball. These sweaters are sure to make you the center of attention this Christmas. Wearing an ugly Christmas sweater brings some comic relief to the sometimes stressful conversations that happen around the holiday time. Ugly Christmas Sweater breaks down the qualifications into 4 categories: Gaudy, Kitschy, Punny, and Raunchy! Wearing an ugly Christmas sweater comes with a touch of nostalgia. What was once a 80’s trend is now the current holiday must have! People of all ages are partaking in this craze. These sweaters will not only make you the life of the party, but keep you warm and cozy while doing it! Ugly Christmas Sweaters are built tough and can stand their fair share of rough and tumble. They even have 3D sweaters that were featured on Live with Kelly and Michael! These exclusive 3D sweaters each have a cute and loveable little antlered stuffed animal bursting from the front of your sweater and his fun backside resting on the back of the sweater! Wonderfully ugly holiday apparel is their Ugly Christmas Dinner Jackets and Blazers.